You can't help but love Enterprise. The folks here have been welcoming and friendly from the moment we moved here. Great schools, a neat downtown that is growing and Enterprise has lots to do and good shopping. Not too big, not too small. Our neighborhood is great for families or those who enjoy a family-type atmosphere. It’s a very safe neighborhood, so you'll see the kids out on their bikes and families walking their dogs. I always loved it because it was a great place to run around for exercise. We have had block parties and neighborhood get-togethers in the past as well. Enterprise has no shortage of excellent restaurants. We have many fave places to eat. Nearest is Marco's Pizza (YUM) and Zack's (YUM YUM!). And Cupcakes Y'all (in the same shopping plaza) has THE MOST amazing cupcakes and goodies, to include a great lunch and coffees. You must try Larry's Bar B Que, Annie's downtown and Cutt's for local flavor. Enterprise has recently added Panera Bread and Chick Fil A, and we have a wonderful variety of other really good restaurants like Mellow Mushroom, Ruby Tuesdays and Po Folks, just to name a few. We have several excellent coffee shops. Cupcakes Y'all, as I mentioned above, Dakota's, Nantucket's (downtown next to Annie's) and Boldly Going. Publix!! Definitely, Publix for the best grocery store experience. However, to save a couple of bucks, love Save-A-Lot downtown for their fresh produce and excellent meats. We are military, so I try to frequent the Commissary as often as I can. It’s close enough to make the trip a couple times a month. Also available is Supercenter Wal-Mart and Winn Dixie. When we began our home search, we were drawn to Curington Farms for the location and the home was the perfect size we were looking for. I love the entrance to the home and how spacious the home feels when you first walk in. We have a lot of local family, so it was great to have the dining room so open to the living room; makes for great entertaining. It’s a solid, well built home, too. My husband is so picky, and this home just feels and is solid and well built. My kids will tell you that the carpet in the middle of the living room was what made them love this house (that and the yard!). They specifically told us that they wanted carpet because rugs on hardwood were too uncomfortable to lie on while hanging out with friends and family. The fireplace was wonderful for the winter! It was nice not to use the heater as much. The master is quite the haven! The spaciousness of the bedroom allowed for the larger pieces we had to fit comfortably. What is not to love about that great master bathroom? Plenty of storage and its nice have the toilet "closet," too. Relaxing in the jet tub is easy with the privacy from the rest of the home. Getting ready in the morning is extra nice with the walk-in closet connected to the bathroom. 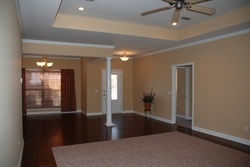 All carpets are brand new and the walls all have fresh paint. You will love the roomy garage, too! Don't you love those awesome shelving units? The pull-down attic door leads to LOTS of storage! Enterprise is a wonderful place to be. There just seems to be something for everyone. Families can easily get plugged in to activities through the various organizations like the Rec Center or the YMCA. Churches are in abundance and Christian faith is strong and thriving here. My husband's Mom moved here many years ago and found many activities through the Senior Circle, volunteering at the hospital and church functions. Great golfing here as well as tennis, baseball, soccer, football, volley ball, basketball...you name it! Enterprise, without a doubt has some of the BEST schools around. Holly Hill Elementary is award winning. From first-hand knowledge as a parent and a substitute teacher, I can attest at the high standards and wonderful, caring teachers this school has. Kindergarten is actually in a school by itself around the circle (an absolutely wonderful school! ), but, 1st through 6th are all at Holly Hill. They just added on a brand new addition there. Coppinville Jr. High houses just 7th grade. Kind of a cool way to handle this age group. Love Dauphin Jr. High (8th grade). The teachers are fantastic and get the students ready for high school. And EHS is by far the most incredible high school in the state!!! My kids go there and love it. Students are respectful, engaged and follow the rules. I have subbed at each of these schools and love the environment, the teachers / staff and the students. My kids have attended them all and loved their experiences. We loved our home there in Curington, along with our great neighbors. We hope you will find it to be the perfect place for you, too. My husband is an avid hunter and loves to fish. So we enjoyed being close to areas where he could do both. The beach is easy to get to...just an hour and a half away! I mentioned before, but I loved being able to stay in the neighborhood for exercise. The kids made tons of friends here, so we felt safe with them running around the neighborhood. Loved that it is a quiet neighborhood. No one gets too rowdy and everyone gets along so nicely. Of course, its easy access to Ft. Rucker, which was a huge plus to my husband, who had worked on post. Easy to get to Enterprise, Ozark and Montgomery. Electricity is with Covington Cooperative Electic Co. Our average bill was probably about $150 a month. Water is with the City of Enterprise. In winter, it ran around $24 and summer around $65 with the sprinkler system running 3 times a week. SELLERS - Please visit www.HowIAmDifferent.com for more info.